3C's Toolbox Pro is the most comprehensive and full-featured all-in-one toolbox for any android user (root recommended but not required). 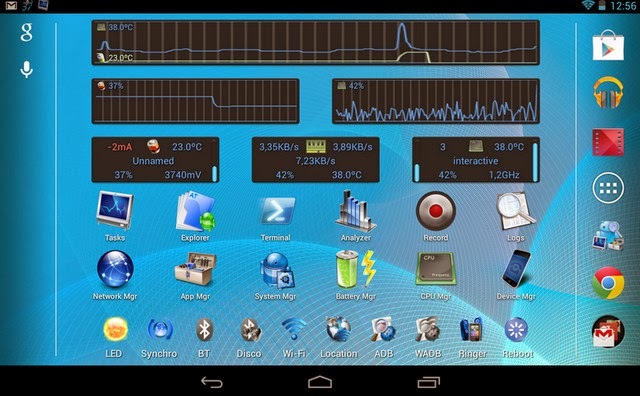 By using this application, you can control every aspect of your device. Update version 1.6.10 added many features! Android Tuner (aka 3C Toolbox Pro) combines the features of many top-100 paid apps like Titanium Backup, Greenify, BetterBatteryStats, App2SD, Seeder, ROM Toolbox Pro, SetCPU, System Panel, Root Explorer, Autorun Manager, Terminal Emulator, Script Editor, SD Booster, BuildProp Editor, ATK and many more.